Is a malaria-free Bangladesh possible? After their recent trip to Bangladesh, and in honor of World Malaria Day, Kasturi Haldar, Editor-in-Chief of PLOS Pathogens, along with Bernard Nahlen, Director of the Eck Institute for Global Health at University of Notre Dame, comment on the challenges to sustaining advances in malaria control and elimination with particular focus on Bangladesh to secure key national and global milestones. From 2000-2015, there was unprecedented worldwide progress against malaria. Over 6 million deaths were averted and estimated malaria mortality rates fell by 60 percent for all ages. For children under the age of 5, the corresponding indicators respectively were 5.9 million and 65 percent. Yet despite remarkable advances malaria continues to have a devastating impact. WHO estimates that in 2016 there were 445,000 deaths and 216 million new cases. From 2010-2016, Bangladesh similarly showed a greater than 50 percent reduction in malaria cases and deaths. But ~ 14 million people continue to remain at risk. 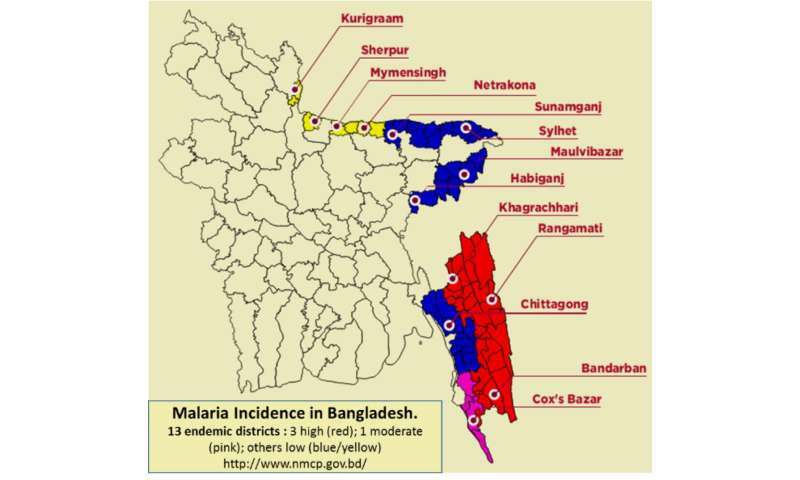 Over 90 percent of cases are in the Chittagong Hill Tracts (CHT) where malaria transmission remains high in many areas and there is a real threat of emergence of multidrug-resistant malaria. This region borders Myanmar and the influx of hundreds of thousands of refugees from malarious Rakhine State in Myanmar to malarious Chittagong Division in Bangladesh heightens concern and need for intensified efforts to prevent, diagnose, and treat malaria there and throughout Bangladesh. Since 2010, seven countries have eliminated malaria (by achieving three consecutive years of zero locally-acquired malaria), and another 14 are projected to achieve elimination by 2021. In April 2015 the World Health Assembly approved the Malaria Global Technical Strategy, which lays out ambitious targets to further reduce malaria cases and deaths by 90 percent and to eliminate malaria from an additional 35 countries by 2030. This will require mobilizing over $6.4 billion a year. While the monetary investment is high, meeting these targets will avert close to 3 billion malaria cases and save 10 million lives. In addition, this will generate over $4 trillion in additional economic output projecting a return on investment of 40:1 and contribute to poverty reduction. For these reasons, investment in malaria is considered a "best buy" in global health. Bangladesh's National Strategic Plan for 2017-2021 envisions an eventual goal of malaria-free Bangladesh by 2030. Is this too optimistic? Through partnership of the National Malaria Elimination Program and BRAC (Building Resources Across Communities, Bangadesh's largest non-governmental organization), Bangladesh has set on a commendable path for 2021 that includes: (i) reducing annual parasite incidence of 13 'endemic' Chittagong Hill Tracts districts to 0.46 and interrupting transmission in 8 of these districts, (ii) ensuring that remaining districts are free of malaria without re-introduction, and (iii) preventing the emergence of resistance to artemisinin-based combination therapies, front-line antimalarials that have been key to malaria control but to which resistance has emerged in neighboring Myanmar and other countries of the Mekong region. To be successful, Bangladesh will need to mobilize adequate financial and human resources to strengthen health systems, particularly in the refugee camps and in geographically remote areas where the malaria risk is greatest, improve malaria surveillance and response capability, and continue to invest in research to address the growing threat of drug and insecticide resistance. Despite these challenges, Bangladesh's long experience in research and effective implementation of programs to address other major health issues positions the country well to be one of the first to eliminate malaria in the Asia region.